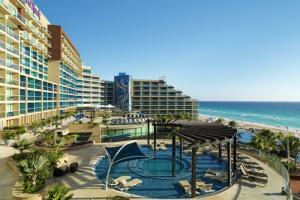 This non-stop, high-energy resort is situated near Cancun's entertainment area. Overlooking the turquoise blue Caribbean Sea, this stunning hotel offers 601 newly renovated guest rooms, each with a double Jacuzzi.® Flanked by the Caribbean Sea and the Nichupte Lagoon, the resort is a short stroll from Cancun's main attractions. Ask about golf packages, wedding packages and Passport to Savings. On the beach in Cancun, 30 minutes from downtown, 25 minutes from the airport. The Market ( International Buffet), Frida (Mexican a la carte), Zen (Asiatic a la carte), Ciao (International / Italian a la carte), Ipanema (Brazilian grill), Pizzeto (brick-ove style pizza), Dive - Pool Bar, Float - Pool Bar, Splash - Pool Bar, Smash Bar - Lobby Bar, The Show (Theatre with bar service during shows).